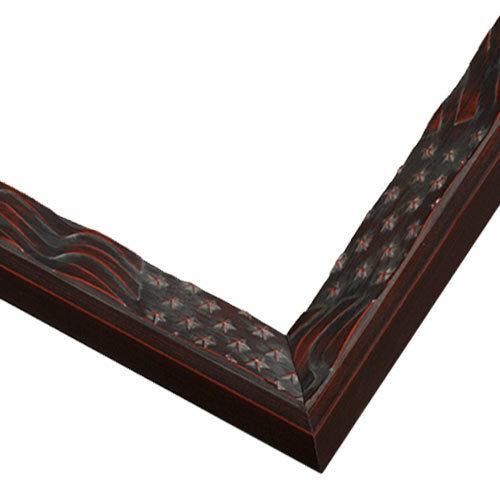 Transform your space with this cherry picture frame’s American flag theme. It features a dramatically sloped profile with a warm, cherry mahogany finish with hints of red. It’s ideal as a military photo frame, American memorabilia frame or document frame. Handmade by our Artisans from natural wood grown in sustainably managed forests. Custom sizes to 1/8th of an inch! Used this frame with mat to make a wonderful presentation for my husband's WWII bomber picture. Very special plane, so l gave it a very special frame. I purchased two Old Glory Cherry frames for my husband's military pictures and they were beautiful. The price was higher than I wanted to pay, but the quality was excellent. It was worth the extra cost to have such well made picture frames. A very unique style. Would recommend a mat to separate your photo or artwork from the very detailed pattern. Only issue is that the color was applied so thin in some places (like edges and the tops of some stars) that they look like scratches or defects. Returning for a new one would not have made a difference, I think it's just the method of application. But I liked it enough to frame a military portrait that I am willing to overlook it. Hello Maria. Thank you for your feedback. We regret to hear that the frames had a scratched appearance. We are willing to send you a free replacement if you would like a new frame. The finish on the frame is very important to the appearance of the frame. This may have been an isolated issue with the moulding having the fading at the corners. Please give us a call at 1-800-332-8884 so that we can replace the frame for you. The frame is for a professional photograph of fire engine. It was selected because of it being patriotic. Can a gold edged white matte be used with the Old glory frame? BEST ANSWER: Hello Jere! Thank you for reaching out to us for your framing needs. Determining if the White Mat with a gold edge (fillet) and the Old Glory frame will be a good combination depends on what you are framing. Could you share with us what you are framing and tell us the color of the décor in the room where the artwork will hanging? We are happy to provide suggestions that will bring your art to life. Please contact us by phone or email. We can be reached at 1-800-332-8884 or customercare@pictureframes.com. If you have any additional questions, please let us know. Happy Framing!